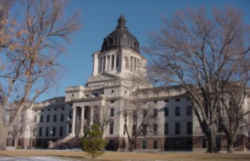 Catch up on your state trivia with these South Dakota history firsts and interesting fun facts about the state. 1803 - US President Thomas Jefferson purchased the Louisiana Territory from France, a real-estate deal that at the time doubled the size of the United States. 1804 - Rivers were the highways in settling the western territory. Lewis and Clark named American Creek when they passed through the Chamberlain - Oacoma area while exploring the territory for President Jefferson in 1804. 1832 - Perhaps the most significant fur trade/military fort on the western American frontier, Fort Pierre Chouteau was the largest (almost 300' square) and best equipped trading post in the northern Great Plains. Built in 1832 by John Jacob Astor's (1763-1848) American Fur Company as part of its expansion into the Upper Missouri region, the trading activities at the site exemplified the commercial alliance critical to the success of the fur business. 1857 - Sioux Falls exists as a city today because the land speculators who staked town site claims there in 1857 came in search of the cascades of the Big Sioux River. 1861 - The first & oldest Dakota daily newspaper, published in 1861 is the Yankton Daily Press & Dakotan. 1875 - The site of a rich gold strike in 1875, Deadwood retains its mining town atmosphere. While Deadwood is one of the most highly publicized mining towns of the trans-Mississippi West, much of its fame rests on the famous or infamous characters that passed through. 1876 - Lead is home to The Homestake Mine, the largest gold mine in the United States. It opened in 1876, making it the oldest continually operating gold mine in the world. It produces about 15% of the nation's gold and still has huge reserves. 1877 - Jack McCall was tried, convicted and hanged two miles north of Yankton in 1877 for the shooting of Wild Bill Hickok. He is buried in an unmarked grave in the Yankton cemetery. 1886 - Henry Holland built an English-style mill in Milbank in 1886, three years before South Dakota became a state. Until 1907 it was used by settlers to grind wheat and corn and to saw wood. The first commercial timber sale on Federal forested land in the United States was authorized in the area of Jim and Estes Creeks (near the town of Nemo). The abundant water flow of Spearfish Creek favored the establishment of a Federal Fish Hatchery in 1898. It is known today as the D.C. Booth Historic Fish Hatchery. 1924 - The Meridian Bridge built in 1924 was the first structure built across the Missouri River in South Dakota. A gigantic sculpture of Crazy Horse, the famous Sioux chief, is being carved in the Black Hills. The project, begun in 1947, remains uncompleted.The Crazy Horse mountain carving now in progress will be the world's largest sculpture (563' high, 641' long, carved in the round). It is the focal point of an educational and cultural memorial to and for the North American Indian. 1953 - Sitting Bull's grave sits on a bluff overlooking the Missouri River near Mobridge. It wasn't always there. In 1953 under the cover of darkness, a group of South Dakotans snuck into North Dakota, exhumed his bones (with his relatives' permission) and reburied them in their rightful home. 1959 - Belle Fourche is the geographical center of the United States of America, designated in 1959 and noted by an official marker and sheepherder's monument called a "Stone Johnnie". More than 90 percent of South Dakota's land area was classified as farmland in the mid-1990s. The famous Black Hills Passion Play is held annually in a natural amphitheater near Spearfish. Evan's Plunge, the world's largest natural indoor warm-water pool, is located in Hot Springs. The Badlands of South Dakota, a region of barren ravines and cliffs, were created by volcanic action as well as by wind and water erosion. The largest buffalo herd in the US lives at the Standing Butte Ranch near Pierre. The geographic center of the United States, including Alaska and Hawaii, is located in South Dakota, 17 miles west of Castle Rock. The Black Hills are the highest mountains east of the Rockies. The Spirit Mound near Vermillion served as a vantage point for Lewis and Clark as they viewed the Prairie Plains. Some of the logs in Petrified Wood Park in Lemmon weigh more than 10,000 pounds. Others contain the fossilized remains of snakes and early marine life. Tom Brokaw of NBC graduated from Yankton High School and the University of South Dakota. Bowdle is known for the tallest water tower in South Dakota. Custer State Park is home to a herd of 1,500 free-roaming bison. Bison can weigh as much as 2,000 pounds. Historically, the bison played an essential role in the lives of the Lakota (Sioux), who relied on the "tatanka" for food, clothing and shelter. With more than 82 miles of mapped passages, Wind Cave contains the world's largest display of a rare formation called boxwork. Badlands National Park consists of nearly 244,000 acres of sharply eroded buttes, pinnacles and spires blended with the largest, protected mixed grass prairie in the United States. Badlands National Park contains the world's richest Oligocene epoch fossil beds, dating 23 to 35 million years old. Sage Creek Wilderness is the site of the reintroduction of the black-footed ferret, the most endangered land mammal in North America. Woonsocket is known as The Town with the Beautiful Lake. Lake Prior sits in the middle of town. Harney Peak, at 7242 above sea level, is the highest point in the United States east of the Rockies. The 9824-acre Black Elk Wilderness in the center of the Norbeck Wildlife Preserve was named for Black Elk, an Oglala Lakota holy man. The Pioneer Auto Museum in Murdo details more than 250 rare automobiles including the infamous Tucker and Edsel. Near the shore of Lake Herman, Prairie Village includes the original townsite of Herman, Dakota Territory. It is also home of the Art B. Thomas Hershell-Spillman Carousel that is complete with its operating coal fired boiler and steam engine. The George S. Mickelson Trail is South Dakota's premier rails-to-trails project. This award winning tail stretches 114 miles from Deadwood to Edgemont. The Crystal Springs Ranch rodeo arena in Clear Lake was built on a drained duck pond. The former duck pond is now known as "America's Most Natural Rodeo Bowl". Faith is famous to paleontologists. Several Hadrosaur, Edmontosaurus annectens were excavated on a ranch north of Faith and one of the largest, most complete, and best preserved Tyrannosaurus Rex was excavated nearby. The Silent Guide Monument in Philip was built in the late 1800s by a sheepherder to mark a waterhole that never went dry. Made of flat stones, the guide originally stood fourteen feet high, and could be seen as far as thirty five miles away. Mato Paha "Sacred Mountain" is the origin of many Native American legends. Rising 1400 feet above the surrounding prairie near Sturgis, and standing all by itself, Bear Butte isn't hard to find. It was used as a landmark by the plains Indians and even today it is considered sacred by the plains peoples. The Anne Hathaway Cottage at Wessington Springs is the only structure in the Midwest US that features a thatched roof. The cottage is styled after the original Anne Hathaway home in England. Brookings is the home of South Dakota State University, the state's largest university, with 8100 students, and a staff of nearly 2000. Yankton was the original Dakota Territorial capital city. The USS. South Dakota was the most decorated battleship during World War II. Newton Hills State Park, south of Canton, is part of a geological feature called the Coteau des Prairie. This narrow strip of rolling hills and forests was created by glaciers and extends along the eastern edge of South Dakota. At its highest point, the Coteau rises to more than 2,000 feet above sea level. For millions of years, Split Rock Creek near Garretson cut deep gorges through Palisades State Park. Geologists say the Sioux quartzite spires are 1.2 billion years old! Glaciers deposited a thin layer of debris atop the quartzite. Beds of dark red pipestone can be found between the layers. This is one of the few areas in the nation where pipestone is found. The mineral is considered sacred by American Indians.